Are mice invading your home? Do you need a proven plan to get rid of them quickly? Are you looking for the best mouse traps and the strategies to use them correctly? Or do you prefer more natural methods to get rid of mice? Maybe you are at the end of your rope & and ready to hire a mouse exterminator? Whatever your situation is, the best way to get rid of the mice is to do it fast. You need to take immediate action. Got Mice? 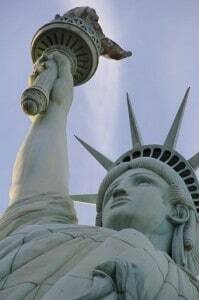 It’s time to clean house! This common household pest can very quickly take up residence in your home and start nesting. If they find a source of food & a little shelter where they feel safe, they may not leave the house again. 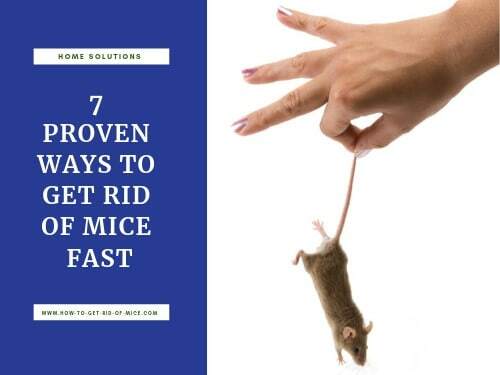 This series of articles will give you all the strategies for getting rid of mice fast whether you use mouse traps, repellents, live traps, exterminators, humane or natural methods. It can be easy to get the mice out of your house as long as you have a plan of action & follow through on that plan. Mousetraps are normally the first thing people try when they discover they have mice. 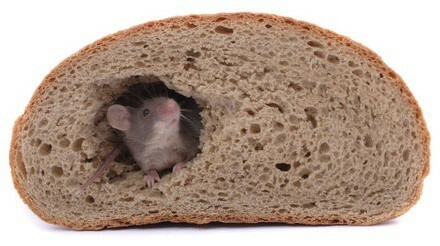 This is a tried & true method for a rodent free home. Here are answers to the most frequently asked questions for using mousetraps. What type of mousetrap is best? Snap Traps are undoubtedly the most common, you can choose from the inexpensive wooden traps or the plastic fully enclosed traps so you don’t need to see or touch the dead mouse. A few other good choices include Electronic, Live Catch and glue traps. See our article on the best mouse trap types for a detailed explanation and the pros/cons of using each. How many traps should I use? More than you think you need! A good rule of thumb is to start with at least 6 traps. Even if you only saw a single critter, house mice live in large groups, so trust me on this, there are very likely many more living in or near your house. Where should I place the mousetraps? Some of the most effective locations include baseboards, under the kitchen sink, behind the stove, in your attic or crawlspace. The specific location that works best for you will be close to where they are sleeping. 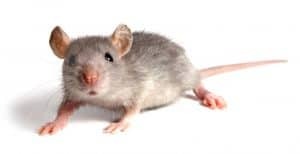 If you are unsure where this is, look for signs of a mouse in your home such as mice droppings, small holes and gnaw marks near the entry points of your house. The trap location should also be in a somewhat sheltered area so the mouse feels safe enough to investigate it & hopefully take the bait. See our article on using mousetraps effectively for more information. Making the decision to use poison is a controversial one, even in the pest control community. Some people feel it’s cruel since most poisons work by dehydrating the mouse. But it’s a personal decision. Mice carry diseases and can be a real health hazard, so sometimes it comes down who is more important: your family’s health or the little mouse? 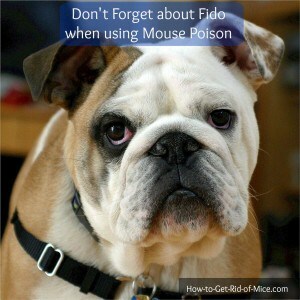 If you do decide to use poison to kill the mice in your home, just follow these precautions to protect your family, pets, and children. Always place mouse bait in sealed bait stations. Don’t place the baiting stations out in the open. They should be under cabinets, behind the refrigerator, etc. Only use poison inside the home. Don’t place it outside where a pet could accidentally eat it. Always wear gloves and dispose of them afterward. Be sure to wash your hands thoroughly. Store extra containers or poison in a safe location out of the reach of children or pets. There are many DIY projects and home remedies you can use to control the rodent population around your home. You can focus on the outdoor area and attract predators such as barn owls to your property. Some folks have reported success by using a DIY mouse poison bait made from dried potato flakes to kill mice. Having a good mouser in the house is a win for both you and the cat. Getting a cat or a rodent hunting dog like a terrier is another very natural way to prevent field mice from coming near your home. Did you know that rat terriers earned their name for their skill at hunting rats? And if you can’t get a cat, then see if you can borrow a little used kitty litter and place it near the entry points of your home. Many of these methods are also effective to keep rats and other problem rodents away. Read more home remedies in this article. Natural methods to prevent house mice include the use of deterrents like strong smells that drive the mice away. When a house mouse finds a new place to live (such as your kitchen or basement) they will leave a pheromone trail behind so the rest of the rodent family can find their way into your home. A great way to prevent this is to clean with a strong smelling product such as ammonia. This will wipe away any trace our little furry friends might leave behind. There are commercial products available as well that do a good job of preventing house mice from entering your home. One example is Fresh Cab which is a natural product that smells a bit like fir trees. 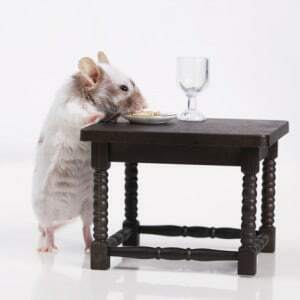 See our article on Getting Rid of Mice with Strong Smells for some specific tips. The garage or toolshed is a favorite nesting place for mice. The entry points are typically a little less secure than our front door and the area is quiet for the majority of the day. Garages are warm and have plenty of hiding places. A whole mouse family could easily live there for months without us knowing as many people don’t spend too much time in these areas. We also love to store rodent tempting items such as cardboard boxes or bird food in out of the way places. For example, if you have a big bag of birdseed in your toolshed, the mice are just going to love you. They may not go for the little bit of peanut butter in your traps, they’ll take the big open bag of birdseed instead, then tell all their friends to come on in and join the party! Keep your eyes peeled for any signs of mice in your outdoor storage areas and prevent a possible mice infestation before it starts. 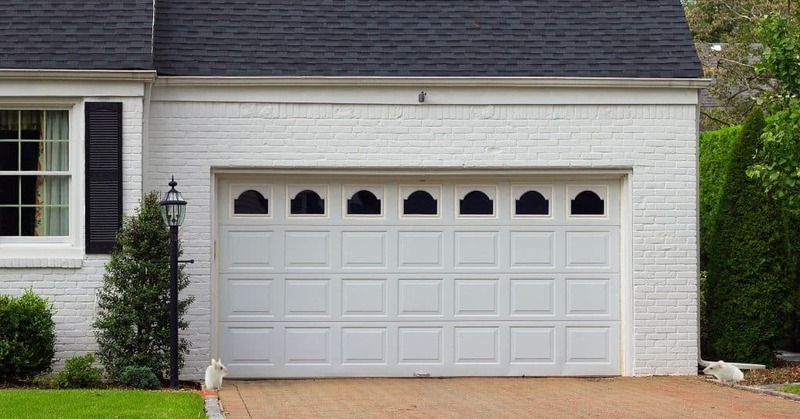 And check out this article to find additional ways to keep the critters out of your garage. When do you know it’s time to hire an exterminator? If you have been trying to solve it yourself for more than a few weeks, your best solution is to hire a pest control expert. Most people will try to catch the mice first, which is common. But if you have been trying a while and have not been successful, keep in mind that mice breed very quickly and can have up to 5-10 litters a year. 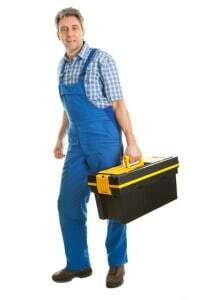 Hire a pest exterminator and let them do the dirty work for you. A professional mouse exterminator will know all the best hiding places and save you a lot of time locating the source of your problem. They are trained in all the evasive tactics mice will use to escape your traps. They know the best baiting tricks & ways to catch even the smartest rodents. They will know how to find the areas of your home where the mice are getting in. And a good pest control expert will seal up the points of weakness in your home for you. Or at the very least give you instructions on how to do it yourself. Finally, your mouse exterminator will follow-up and inspect your home. They will replace the traps, refill the bait station and adjust the plan as needed to ensure the mice are completely gone. Before you hire any contractor to come inside your home, you should always check their credentials and be sure to compare quotes/service offerings from several companies. 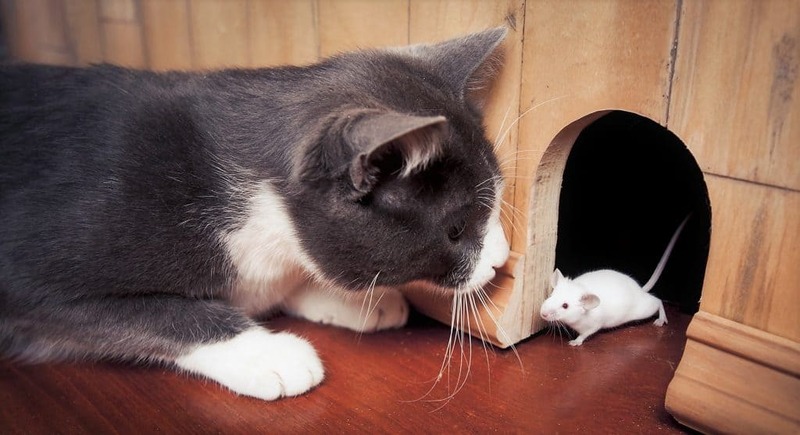 If you decide to consult a true mouse control expert, see our article on How to interview & hire a mouse exterminator. No matter what method you choose for pest control, you will also need to work on prevention. And you can start this step while you are still catching mice; in fact, I highly recommend it. We have a page on prevention which will help you mouse-proof your home and take all the right steps to keep the little guys away. The two most important steps are to keep food stored away in sealed containers and secure your house from any points of entry with household items like steel wool. Read this article to see all the ways mice can get inside your home. Don’t give easy access to your food. Seal it up! You may decide to hire a handyman or let your mouse exterminator secure your home. But keeping all your food tightly sealed is an easy fix. Take a look through your kitchen and find any possible food source that could attract mice. These items should be stored in a rodent proof container like a metal breadbox or glass canister. This includes loaves of bread, fruit, bags of sugar or rice, pet food, boxes of cereal, etc. Place these items in a tightly sealed aluminum can or very secure plastic container. Use our tips for using mouse traps to get rid of the mice. If the traps alone don’t work, try bait stations. 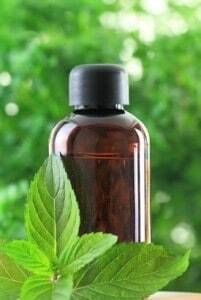 Experiment with natural methods like peppermint oil or kitty litter. Use strong smells to deter rodents and erase the trails they leave behind. Hire an exterminator & let someone else do the dirty work. Take precautions by securing any exterior gaps and keeping food sealed up tight to prevent the mice from returning. Get the mice before they get to you! Follow one of these 7 ways to get rid of your rodent problem, or better yet you can try them all! Just remember to act quickly. The longer you wait, the more difficult it becomes. What starts off as a small family can quickly become a mouse infestation if you wait too long. It’s much easier to get rid of 6 mice than 30 or more. Need dependable mouse control services for your property?